The winding bike course stretches down Memphis’ Greenbelt Park lined by the Great Mississippi River on an early Sunday morning. Lookers-on stand atop a hill above the course waving cowbells with the passing of each cyclist. 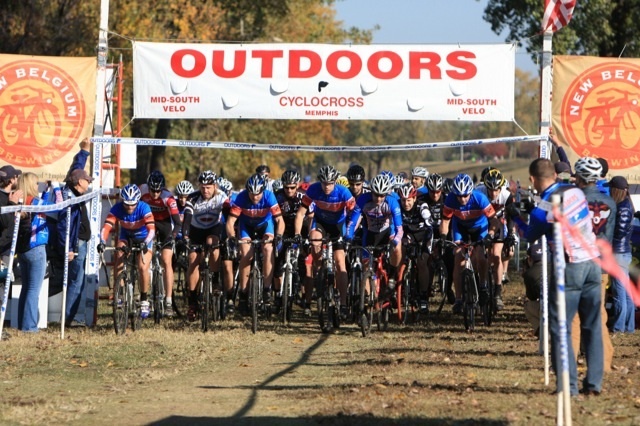 The 24th Annual Outdoors Inc Cyclocross Championship Race is in full swing. 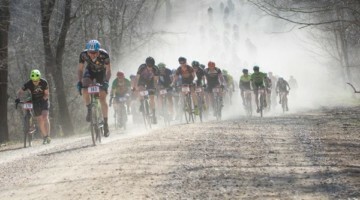 The race, which is the longest running Cyclocross race in the United States, was created to give cyclists an alternative training option in the colder months. Race director and co-owner of Outdoors Inc, Joe Royer, spent over 20 years racing in cyclocross, road and mountain bike races all over Europe and America. With each race he gained the knowledge and experience to bring the highest quality bike race possible to his hometown of Memphis, TN. The course wraps around the Park, taking the riders up hills and over barricades where they have to dismount from their bikes and carry them as they jump over and remount.For a unique twist this year, the barriers were constructed from Cottonwood trees pulled right out of the Mississippi River. Over the years the race has been held in many different locations around Memphis, but Joe Royer, race director and co-owner of Outdoors Inc, says people just love the race being located along the Mississippi River and in downtown Memphis. Riders sweep around a 1.5 mile loop for 10 to 50 minutes depending on age and category. The C race starts off the festivities with children, ages 3 to 14. The youngest, 3-5 year olds, take off down a 50 yard dash, followed by the older kids riding around a shortened track for 10 minutes. The B race is for beginners and riders who are a little more experienced. The A race is rapid paced with Nathan Rice and Katherine Williams leading the men’s and women’s divisions for a 50 minute race. In previous years, the winners have been renown cyclists from all over the United States including National Cyclocross Champions Paul Curley, Steve Tilford, and Frank McCormick. Needless to say, the 2010 racers were in good company. For the race to run smoothly, it takes attention to detail from all the Outdoors Inc staff handling the event. “Everything from registration to the take down of the course has to be perfect,” says Royer. The company dedicates extra time for the take down after the race to guarantee that the race site is left cleaner than they found it. This could be a detail that will ensure the race will stand the test of time. Complete results can be found on the Outdoors Inc website. Next post Gut-Wrenching Mechanical Mondays: Pit Tools! Hate to be a bug, but Surf City Cyclo-X has been running since 1976, or 34 years, but not consecutive, though it's only missed a couple of seasons.